Scuba diving Mexico is suitable for divers of all experience levels although the dive experience will vary depending on which coast you are on. The Pacific Coast offers some great shark dives and you can even go cage diving with great white sharks, whilst the east coast which is edged by the warm Caribbean Sea offers a more colorful range of scuba experiences. Scuba Diving Mexico is mostly done in the River Maya which Includes The island of Cozumel. Cozumel is one of the most highly regarded scuba dive hotspots in the world and has many dives suitable for novices and experienced divers alike. From lazy drift dives to exciting reef and wall dives. Scuba Diving Mexico is not complete without a visit to the Cenotes off the Yucatan Peninsula. Cenotes offer a unique cave and cavern dive experience, but it is not for those with a fear of enclosed spaces. The Mexican Cenotes are one of the few areas in the world where you can combine both fresh water and salt water scuba diving on the same dive trip. Entering some of the more secluded and totally submerged caves should only be done with a fully qualified and experienced guide. When to go scuba diving in Mexico? Mexico is sunny and warm for most of the year and for diving a 3mm shorty or skin is recommended for the hotter months and a 3mm-5mm full wetsuit for the cooler months. Visibility: Varies between 25 – 60 metres depending on dive site and time of year. Cozumel: Cozumel is situated just off the eastern coast of Mexico’s Yucatan Peninsula. The best time to dive here is between March and August. Cozumel is believed to be one of best reef diving sites in the world and is notable for the amount of drift dives available. Cancun: The best time to dive Cancun is also between March and August. Wreck, reef and cenote diving sites are available. Visit the underwater museum for an experience like no other where you will find hundreds of life sized statues on the ocean floor. The Cenotes: Incredible sink holes off the Yutacan Peninsula some of which have closed ecological systems, having no access to the open sea. Best time to dive the cenotes is between November and March. Cave diving can be dangerous and only advanced divers are recommended to try the totally submerged caverns. Pacific Coast: The water is cooler along the Pacific Coast with less visibility (approximately 23 metres). The best time to dive here is between August and February. The Pacific Coast is great for shark watching, especially great whites. Between April – May and September – October visibility is limited due to plankton bloom. May through to September is hurricane season and it can become unbearably hot, between 35oC – 40oC with unpredictable and violent storms. How to Get to Mexico? Depending upon where in the country you are staying, you have a choice of four airports at which to arrive; Mexico City, Cancun, Monterrey and Guadalajara. They all accept international flights but only Mexico City and Cancun accept direct flights from Europe. Travelers should be aware that the cost of flights increases around the Christmas holiday and New Year period and during the peak of summer season. For those travelers who are wanting to include a visit to Mexico on a tour of Latin America they can save money on their travel fares by purchasing an ‘open’ ticket which allows you to fly into one airport and depart from another, and there are a number of travel agencies that provide this option. Mexico is a country of sandy beaches and ancient history, vibrant nightclubs and secluded bays. The life and culture on the land is just as diverse as the landscape beneath the waves as on the western coast the waters of the Pacific Ocean offer a different dive experience to the contrasting waters of the Caribbean Sea in the east. Scuba Diving Mexico can be as exciting or as relaxing as you want to make it and every visitor that comes here returns home with their own unique impressions of this incredible country. Adventure awaits those who venture from the beaten track and for those who wish for nothing but rest and relaxation while they are here; all inclusive resorts cater for their every luxurious whim. 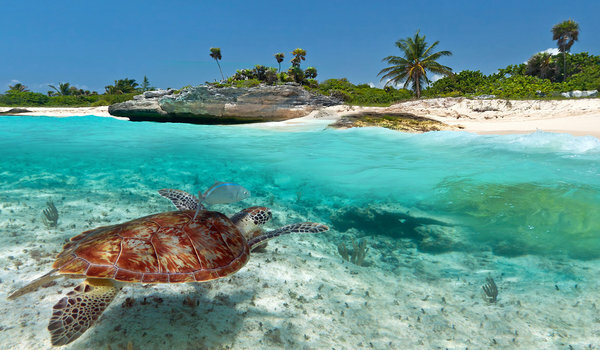 Want to dive in Mexico? Pluto Dive, scuba diving in a magical enviroment, Playa del Carmen and the Riviera Maya.